Teri Dale noticed a lump on her neck in 2014. She was diagnosed with Hodgkin’s lymphoma in March 2016. She opted out of conventional treatment and made a decision to radically change her life and take control of her health. And within 9 months, her body had healed, and in December 2016 her PET scan was all clear! Teri is now a Healing Strong group leader and I’m so excited to share her story with you. 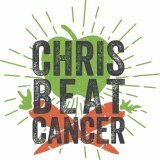 Watch our interview below, or listen to it on the Chris Beat Cancer podcast on iTunes or Spotify. « What’s In My Shower?